Sharon Paster is a San Francisco Bay Area artist based in Sausalito, CA. She uses oil pigment sticks to create abstract landscapes that explore the potential for movement and change. She is drawn to the energy around her—the force of a pounding surf, the motion of cars, the way objects in space talk to one another. She layers oil colors, plays with space, and contrasts the solid with the ephemeral—the fixed with the fluid—to explore the transitions about to take place. The surface is often calm, but the tension is ever-present. Everything pulsates with life. Sharon is influenced by her surroundings in Northern California, but also makes frequent trips to Baja, Mexico. She was born in Oak Ridge, Tennessee, but moved around quite a bit growing up from Connecticut to Southern California, and then New England, where she put down roots as a teenager. She graduated as a painter from Brandeis University, in Massachusetts, Phi Beta Kappa within 3 years, and promptly stopped painting. She began again years later in Northern California and has been exhibiting her work since 2002. 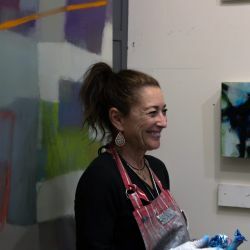 Sharon has participated in numerous group and solo shows including the Marin Museum of Contemporary Art, the San Jose Institute of Contemporary Art and the Sonoma Valley Museum of Art, along with San Francisco Art Market. Her work has been seen in Art of Northern California, the Serena & Lily Catalog, Luxe Magazine, Houzz, San Francisco Magazine and Marin Magazine. She sits on the Board of Directors of the ICB Sausalito Art Center and is represented by a number of galleries in the San Francisco Bay Area and Boston, MA: Simon Breitbard Fine Arts, Studio Shop Gallery and Jules Place. "I have loved the smell of oil paint and turpentine ever since I was a little girl watching my grandfather work. Turpentine is no longer used, which is a good thing--but I miss it!" "I try to convey a bit of spatial mystery in my work. I want the viewer to feel comfortable, but I'm most interested in taking them on a journey around the 2D canvas, and then entering the 3D space into the canvas as well. Some areas are quite flat, and then other parts open up and have you dive in. I like to mix it up. Most of all, I am interested in the relationships and movement between things--colors, shapes, forms." "I spent many years exploring how objects in a landscape relate to one another. A friend suggested I look down, and it opened up a whole world of fixed objects (rocks) that relate to fluid space (water). For some reason, this combination of elements is fascinating to me. I also really enjoy figurative work, drawing in charcoal and sculpting in plaster. I find these different media to be very flexible and responsive to what I'm trying to do. They adapt to the pressure of my fingers and absorb my reaction to the space I'm trying to portray." "You need to be surrounded by things you love, or that stimulate you in some way." "I learned a long time ago that I don't like too much process. I mix colors directly on the canvas using oil pigment sticks, which minimizes both waste and cleanup. The sticks are made of concentrated oil paint and can be blended with various oil media. I use brushes, paper towels, hands, what have you, and often add a bit of charcoal as well. I love drawing, and I appreciate the versatility of the oil sticks as both drawing and painting tools." "Everytime I start a new piece it's like I never painted before, wondering how to start and if I'll be able to make something that moves me. You just grab hold of one thing and let yourself respond. The end comes when everything feels resolved, there's no one part crying out for attention, and nothing more can be done."